President Ameenah Firdaus Gurib-Fakim of Mauritius is part of an exclusive club of women leading African nations. The club has just three members: Gurib-Fakim, Liberian President Ellen Johnson Sirleaf and Namibian Prime Minister Saara Kuugongelwa-Amadhila. When Sirleaf leaves office in January, Gurib-Fakim will be the only remaining female head of state on the continent. "I am an endangered species," she joked to VOA on Sunday in Washington. 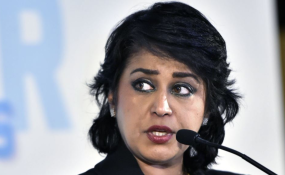 Gurib-Fakim has been president of the island nation of 1.2 million, situated east of Madagascar, since being elected by the National Assembly in 2015. She said the need for more female leadership goes beyond just numbers. It's a matter of capitalizing on the talent of the entire population instead of just half of it. "You cannot win a football match, for example, if you leave 52 percent of the team on the bench," she said. "So, if we want to make a dent in many spheres, we need to take on board women's intuition. We need to take on board women's capacity, and we need to bring the women on board because we're bringing a different dimension to the thought process." Gurib-Fakim is a biodiversity scientist with a doctorate in organic chemistry. She chairs the leadership group of the Coalition for African Research and Innovation (CARI) and visited Washington this week to meet with the Gates Foundation about CARI's work. The idea of CARI, she said, is to build up funding and infrastructure for African scientists "who are working in key areas of health, sustainable development, energy, water — you know, all the issues which will help the African continent to be successful on their sustainable development goals." She recognizes that climate change and food insecurity are urgent problems in Africa, which is struggling with increasingly frequent droughts and other weather-related disasters. "What we are witnessing is the disruption of climate change, so [food security] will be impacted," she said. "It is also a given that if you improve by 1 or 2 percent in agricultural productivity, you will remove 40 million to 50 million people out of absolute poverty, so we need to relook at this sector." Technology will drive some of this adaptation. Gurib-Fakim pointed out that mobile phones are allowing herders to track weather patterns and markets for their livestock. And many of Africa's herders and farmers are women, she noted. "We must not be coy about it," she said. "Women feed Africa." Before leading Mauritius, Gurib-Fakim ran a successful company, Centre International de Développement Pharmaceutique, that researches plants and their applications in the fields of cosmetics, nutrition and therapy. She said she's translated that business experience into a blueprint for success in politics. "When I was in my company, when I was recruiting people, I was recruiting the best," she said. By hiring the best people, a company thrives, and that same focus on merit in the public sphere can help countries move their societies forward, according to Gurib-Fakim. "You don't need to have a special name. You don't need to have a special faith to have an ideal. So, this is what we have to nurture," Gurib-Fakim said. Mauritius already has one of the strongest economies in Africa, based on exports of sugar and textiles and a banking sector that draws in many foreign businesses that are attracted to the island's stable politics. Earlier this year, Bloomberg News trumpeted the sector's success, saying, "Mauritian banks are becoming beacons of growth and stability in sub-Saharan Africa." Less than 10 percent of the population lives in poverty, and for years headlines have spoken of the "Mauritius miracle." Gurib-Fakim rejected any notion of a divine economic phenomenon, however. "There was really no 'Mauritius miracle.' It's been a mix of hard work, institution and also safety nets for the people," she said.